Ludovic Van Waerbeke is professor in the Physics and Astronomy Department at the University of British Columbia and a Senior Fellow of the Canadian Institute for Advanced Research in the Cosmology and Gravity Program. Research Interests: Cosmology, dark matter, dark energy, early universe, inflation, structure formation. The study of the universe is stumbling upon two mysteries: it is made of 5% of normal matter, 20% of an unknown type of matter, dark matter and for 75% of a puzzling form if energy, dark energy. Normal matter can be seen with traditional observational techniques that capture light at all possible wavelength with all kinds of telescopes. Dark matter can be detected indirectly with the gravitational lensing effect. The effect of dark energy can only be measured on the expansion rate of the Universe. Using a combination of observations of normal and dark matter and dark energy, my research is a quest for a better understanding of the Universe and its fundamental laws, the large scale structures, galaxy clusters and galaxy formation. This image is the largest map of dark matter in large scale structure ever made. 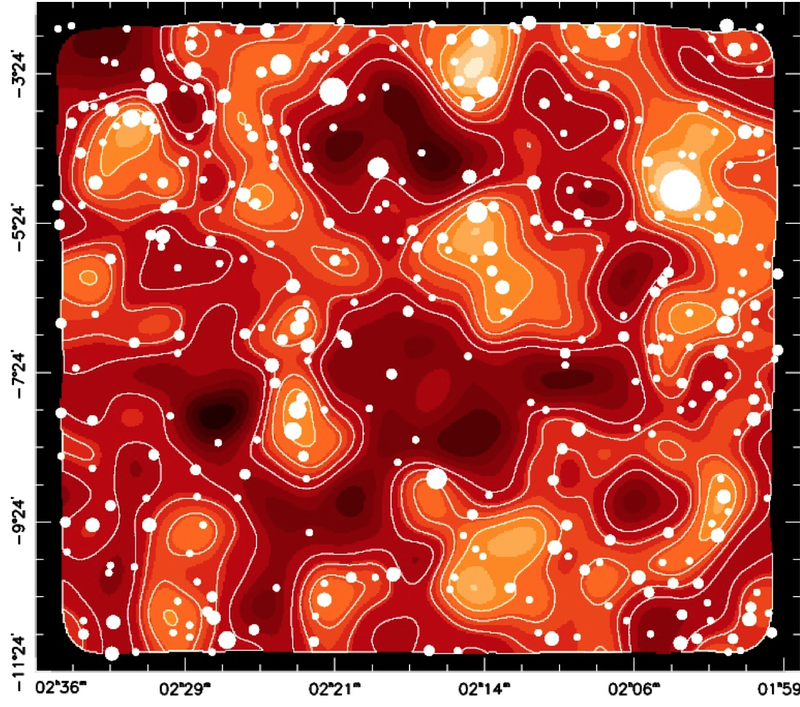 White contours delimit dark matter mass density levels; orange regions are dense, dark-red regions correspond to cosmic voids. White circles indicate the average density of normal matter, traced by star light in galaxies, which tends to coincide with the dark matter densest regions. The area of the sky is 8x8=64 square degrees, which is a large field of view of several dozens of Megaparsecs across. More details available here.